The Destiny of One: I Did It!!!! 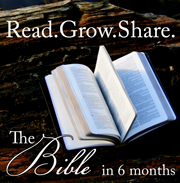 I finished the Bible in six months!!!! I'm working on it... hahaha... Only on Lamentations though :) And its been WAY longer than 6 mon. for me! Hi Hannah, congrats on reading through the whole bible in six months, that's amazing, it took me over a year. Your very determined! I got a post on my blog saying that I was awarding, but I am not sure as to what you are referring to, if you could tell me where to find the post that would be great, tks! Hi Sarah, congratulations on finishing read the Bible through in six months! I read the Bible through two years ago but I did it in a little under a year. I'm sure it was hard at times to stick with it and I know Satan had to attack you at times. Congratulations again! I'm so happy for you! :) Yes, I agree with Rachel-clap clap! !